The story of the 2013 Boston Marathon deserves to have more than just its tragic ending told. I’ll get to that ending, but first, I want to give the race’s positive aspects – and there were many – their due. My parents and I arrived in Boston on Saturday. Our hotel, the Hyatt Regency, stood within walking distance of everything we needed – beautiful! That evening, we ate at the Union Oyster House, the oldest continuously-operating restaurant in the nation. I gazed longingly at the shellfish being consumed all around me, but played it safe with broiled scrod. Still delicious. Seemingly, and rightfully, everything associated with the Boston Marathon gets described as “something to see at least once in your lifetime.” This begins with the buses pulling away from Boston Common. Dozens of buses, all in a single line, tasked with delivering over 25,000 runners to the mild-mannered town of Hopkinton. It’s awe-inspiring. And then, the Hopkinton staging area itself: such fertile ground for utter chaos, but somehow, things stay organized, and every runner lands in their assigned starting corral. Again, awe-inspiring. And then the race actually starts. I won’t go into much detail about my own race experience – at this point, it seems trivial. The weather was magnificent. The fans, as they always do in Boston, set a new standard for cheering. I owe a special thanks to God and my foam roller, because eight days prior, I tweaked my knee and wasn’t certain I’d be able to run 26.2 miles at all. My finishing time was 3:15:52. My legs were screaming, but my knee stayed quiet. I was grateful. After finding my parents in the family meet-up area, I was cold, my body hurt, and, per Hal Higdon’s “27th mile” rule, I knew I needed to keep moving. So after a couple quick photo ops, we walked [ok, I didn’t walk; I wobbled] back to our hotel, about a mile and a half or so from the finish line. Two thoughts keep running through my mind. One: Yes, the Boston Marathon is the oldest marathon in the world, with prestige and high visibility. Whoever is responsible for this horror knew that. But do they know anything about runners? Do they know anything about marathoners? Do they know anything about the Boston Marathon? Remember the tornado in Joplin, Missouri a couple years ago? There was supposed to have been a race there. It got cancelled…but many registrants showed up anyway to help with community clean-up. Same goes for last year’s New York Marathon. Running, in spite of being such an individual sport (or maybe because of this? ), is one closely-knit community. We help each other. Runners are also tough, and resilient. When we train for marathons, we put in months of work. We voluntarily put our bodies, minds and spirits through tests of sometimes-nightmarish rigor. We have bad runs and get over them. We have injuries and get over them. We soil ourselves in every way imaginable, and see others doing the same, and we get over it. We share water, food, toilet paper, elation, and despair. We keep on running. And the Boston Marathon? It’s been around for 117 YEARS. That is commitment. That is resilience. Whoever is responsible for this doesn’t know us at all. The second thing that I keep thinking about is what happened after those explosions. I have never witnessed such an outpouring of support and concern – not just directed at me personally, but everywhere, by everyone (major kudos, by the way, to the Hyatt Regency staff, who treated us marathoners and our families like 24-karat gold). What happened in Boston is atrocious. But if there’s any sort of lesson, any sort of positive speck that I’m taking from this, it is that PEOPLE CARE. I have plenty of jaded moments, thinking how disconnected we’ve become as a society, thinking how ego-centric people are, myself included. I’m ashamed that it took something like this to make me realize the error of this attitude. Running isn’t broken. Marathons aren’t ruined. They are, however, in need. They need prayer, and they need people. Resilient people. People with quiet yet ferocious tenacity. People who the word “unwavering” doesn’t even begin to describe. People who keep at something, not for attention or any grand, showy purpose, but simply because it’s part of who they are. I don’t know about the rest of you runners, but I know a person or two just like that. Beautiful post. And congratulations on your race. The world fell apart, but you achieved something special, and that deserves recognition too. I have followed Running Sunflower’s blog for some time, and was excited for her chance to run the Boston Marathon. And when I saw the news, I was really upset because not only was it horrifying and terrifying, but I *knew* someone who was there!! With that in mind, her positive and thoughtful post, I felt, required some sharing. Wow, that was so moving!!! Through all this darkness it was nice to see some light through your positive words. Also, congratulations on a great run!! So glad you were OK. For all the evil in the world there are many more good people who fortunately help those in need. Wonderful post and congratulations on running a great race! Thanks for shining a bright light on your experience, particularly in the face of such a horrible tragedy. Words can’t express the horror of this tragedy. Thank you for being such a good person that you show how something positive can come from it. I’m glad you are all right and my prayers are with those who weren’t. The world may be broken, but the people in it are not. I’ve never been prouder to call myself a runner! Great perspective and a beautifully written post. I am so relieved that you and your family are ok. Congratulations on your incredible accomplishment, too! Thank you for your example and your inspiration. You are right. We must run on. We can’t let the bad guys win. And congratulations on a very nice run! Thanks for sharing your experience. Congrats on your race! I was very moved by your post. I’m continuing to pray for all those affected by this. I doubt I will ever have the joy of running Boston, but I have family there and I am from New England and I know that area well. It broke my heart to see what happened, and I pray daily for the people who were killed and injured. But as you said, runners are resilient by are very nature as runners. We push beyond our boundaries on a regular basis. This race is not going away, not are other marathons. Very well written. So glad you are fine and finished the marathon in such an amazing time. Tomorrow I shall be running with a black ribbon on my shirt in memory of all those effected by the bombings in Boston. Very well stated! The resolve of a Nation is akin to Runners finishing a race—– the book of excuses is written again and again, but the resolve to finish is like a lighthouse showing ships how to get home.—-this is why running is personal. Congratulations on this significant accomplishment! So beautifully said. 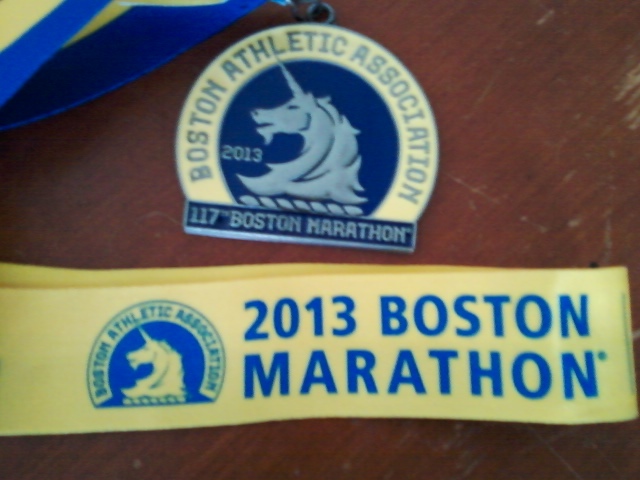 I am a Bostonian by birth, NYer by residence, and runner at heart. You’ve captured the spirit of a city and the passion of runners everywhere. Thank you for doing that and congratulations on your run. Let no one event ever diminish your success and achievement. Your words and your deeds are inspirational. Thanks. Beautiful post. And congratulations on you race. Fantastic! Well said and so very true. Thanks for saying it so well. Well said. We are not broken. Something pure and true has been tarnished on this Patriots day. But Patriots we remain and runners we are. We will take this piece of tarnished Boston silver and polish it new and run our race again next year. So meaningful! Thanks for the post. I ran the first marathon in the USA the Saturday after Boston. It will remain the most amazing experience to me. Boston Strong!